In a world where protectionism and isolationism are on the rise, world trade must continue to grow in people´s minds as a fundamental pillar for prosperity and development. Callao seaport, Peru's main export outlet, 2012. Flickr/ Alex E. Proimos. Some rights reserved.Anarchy and mistrust were the norm in the realm of international politics even before the rise of western nations through the Peace of Westphalia. In the twenty first century, international politics are still subject to movements in diplomacy, economic ties and international organisations. There is a system of alliances where less powerful nations aim to secure their future among those that historically have set the rules of the game. These rules are a construct of multilateral agreements based on trade promotion, integrated zones with free circulation of goods, services, capital and people, common rules and a focus on increasing the wellbeing of their inhabitants. Here in Peru, we feel that as a country hoping to leave the ‘middle-income trap’ category, globalisation has become a fundamental tool for development and prosperity. The integration of the world through a shared vision of community where, with the exception of a few rogue states, barriers that hinder the free movement of people, complicate investment, and delay intercultural exchange are being destroyed. To put it concisely, we are seeing today a United Nations front, where the big players continue to work for themselves and the little ones strengthen their bargaining chips through unity and participation. “Geopolitical thinking constructs narratives at the interplay of territory, geography, and politics, and with regards to how these elements should shape the interactions of states within a region”. For Peru, securing the future of our development and prosperity has meant taking advantage of our privileged geographical position as an epicentre of commerce and terrestrial corridor between the more economically advanced Asia-Pacific nations, and the Atlantic countries of South America. Geopolitically, Peru can be considered a potential candidate for leading future trade and development in the region. Globally, if Peru wishes to secure a brighter future, it has to: 1) improve trade facilitation (through standardization, simplification, harmonization of bureaucratic procedures within countries, reducing information gaps and administrative processes); 2) improve and invest in connectivity infrastructure (soft and hard connectivity); 3) promote political stability (democratic); and 4) increase international cooperation (through developing and executing cooperation mechanisms). 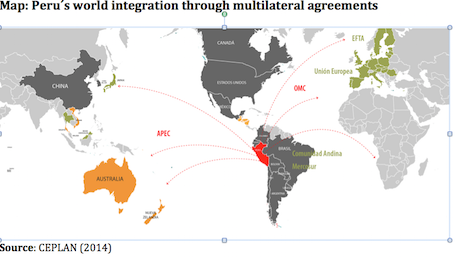 As a region for development, Latin America´s complex topography presents a fundamental hurdle to regional integration. Its dry and high-temperature deserts, its cold mountains and its impenetrable rainforests, make interconnectivity a challenge. But what obstructs integration even further has been the lack of political will to develop the necessary infrastructure (hard and soft) and communications system to interconnect it. Public policies oriented towards international trade have been one of the main drivers that helped catapult Peru out of poverty. A milestone was when Peru became a member of the Asia-Pacific Economic Cooperation (APEC) forum in 1998. Making the decision to participate in a forum that comprises 40% of the world´s population, 58% of the world´s GDP and 44% of international trade meant a long-term change of perspective and role for Peru, as a nation who would develop with open borders to the Asia-Pacific flow of goods and services into Latin America. Becoming an APEC member paved the way to participate in an open discussion forum with 20 other nations that at the time Peru didn’t have any kind of links with. It made it clear to Peru that participating in trade blocs could bring more prosperity for its citizens. More recently (2011) Peru became one of the founding members of the Pacific Alliance (PA): a regional mechanism established to empower and develop Chile, Colombia, Peru and Mexico as a single negotiating bloc with similar economies, public policies and democratic values, oriented to the Asia-Pacific. This step exhibited Peru’s long-term perspective that trade done in a ‘participatory’ way, as a bloc, was the best system to continue high economic growth benefiting all citizens. As a single nation, Peru´s trade negotiating power parity does not have much leverage, but as part of a bloc, it even awakes China´s interests. 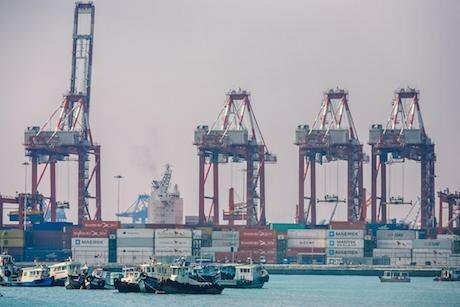 Moreover, whilst the Trans-Pacific Partnership’s (TPP) has hit the buffers, its construction process represented the most recent stepping-stone for development in Peru in the collective negotiation of trade. Working together with such other PA nations as Mexico and Chile, Peru was able to negotiate protection of several national industries and those working in them. We were able to define international agreement norms and regulations to benefit our citizens and our national development, just as much as any other country participating in a trade deal. Since the TPPs demise, conversations have been held discussing the possibility of using the PA as a new platform for integrating Latin America into the world. In the end we hope our citizens will have more prosperity because of this. Peru’s increasing use of interdependence as a method to secure our future, in turn, demands a tighter, more coordinated, and more articulated long-term international cooperation scheme. Working together with our regional neighbours as a bloc, Peru sits in an advantageous negotiating position to become a regional hub of investment, innovation, infrastructure and politics. For example, Peru is actively pursuing entrance into the Organisation for Economic Cooperation and Development (OECD). Raising our development, political and economic standards, to meet those of the OECD, is a huge goal for our nation, one of the reasons we have been taking the above actions to participate in trade blocs. Being part of the OECD would help us continue on this path, and would mean a reconstruction and advancement in our level of participation in the region and across the world, helping us to continue to develop. Moreover, Peru is currently working on implementing the 2030 Agenda for Sustainable Development. In July, Peru will present its first Voluntary National Report (VNR) on the Agenda’s implementation at the United Nations’ High Level Political Forum (HLPF) in New York. Taking on a world commitment with the signing of the Agenda in September 2015 along another 192 states, Peru has set up the challenge of using the Agenda’s image of the year 2030 and its Sustainable Development Goals (SDG) as the new horizon and orientation for the elaboration of a national concerted vision that will be imprinted into our Strategic Plan for National Development. Fulfilling this vision is what we think will lead us not only into development but also into sustainable development. The international realm of politics continues to presuppose a state of anarchy where states look out for themselves and ally with the ones who they can benefit from the most. Peru´s has found that it will improve its long-term prospects if it takes a different, more participatory, approach. In a world where protectionism and isolationism are on the rise, it is fundamental that world trade continues to grow in people´s minds as a fundamental pillar for prosperity and development. In the meantime, Peru will continue to secure its future by instilling interdependence at the core of its international politics. CEPLAN – National Centre of Strategic Planning. The National Centre of Strategic Planning (CEPLAN) is a government institution that acts as the governing, guiding and coordinating body of the National Strategic Planning System. As part of the Presidency of the Council of Ministers, it has served a key role in the process mentioned above. Amongst its main functions is to lead the process of formulating and disseminating a shared and concerted vision of the country's future with a scope that reaches the year 2030 to all sectors and levels of government. The views expressed in this article are those of the author alone and do not necessarily reflect the views of CEPLAN. Nolte, D., & Wehner, L. (2017, April, 04). Geopolitics in Latin America, Old and New. Office of the Press Secretary. (2015, November, 19). Fact Sheet: 23rd Annual APEC Economic Leaders’ Meeting.